I have a new project in the works, but the idea didn’t pop up and hit me in the face like the Milwaukee Brewers historical book. Instead, it gathered steam after Dad passed away in 2015. As I wrote blog posts recalling time we spent together, I observed that many of these memories revolved around baseball and fishing – two of our favorite pastimes. I felt I was barely scratching the surface telling these stories, so one day I wrote about the specific set of events that led up to the two of us fishing for the first time on Long Lake. I decided right then and there to write a book about all of our adventures fishing on Long Lake. Then like a very wise man, I went and asked my wife for her opinion. She had an even better idea – write a chronological book from my childhood to Dad’s last day fishing with Long Lake as the centerpiece. It’s really just the story of a father and son going through life together – shooting the bull while fishing, grilling out, attending baseball games, drinking a beer, and fighting to complete remodeling projects. Bingo! We have a winner – and even a book title: The Long Lake Journal: A Father and Son Memoir. I kept a journal of all the times we fished on Long Lake, which included a lot of information about buying and putting the finishing touches on a nearby cottage. The journal helped me drive the overall arc of the story. This is a totally different project than the Brewers book – mainly because it’s Non-Fiction with a lot of conversation and descriptive settings. I wouldn’t say it’s necessarily harder to write – just different. It’s important for me to stress that the Brewers book comes first and this is a fun “when I have time” project. Now that the Brewers book has been edited and is back with the publisher, I have some down time to focus on the Long Lake Journal. My process has been to scribble in a notebook and type it up later, which has connected me to my early writing in the days before computers. I completed the draft of the manuscript at the end of 2018 and now I’m letting it simmer before doing my own pass-through of editing. After that I’ll find a REAL editor to take a look. With any luck I’ll be able to trick ( I mean, ask) a couple readers into giving me feedback. Once edits are complete, I have a short list of publishers that I’m going to submit the manuscript to, but getting a book deal isn’t my goal. I’ll self-publish if need be just so it sees the light of day. 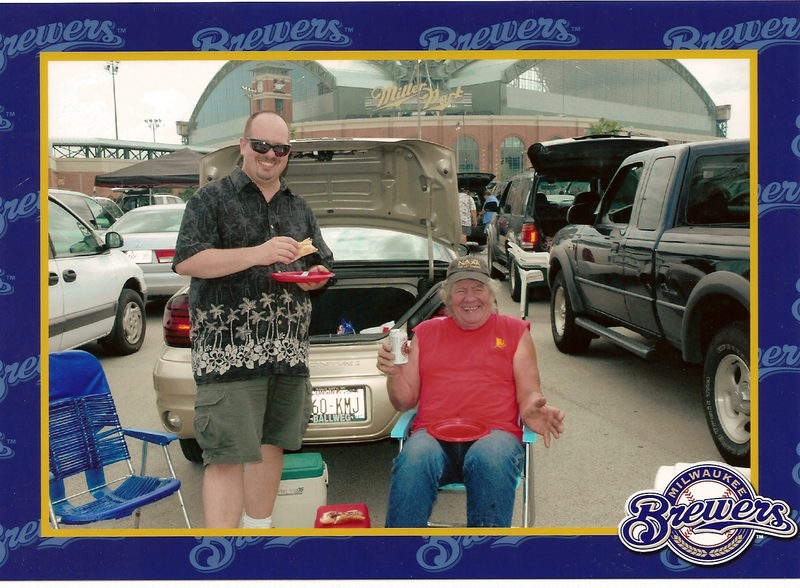 A few of the good things in life – baseball, beer, and brats!